What a fun name! I'm not even sure whether it's pronounced bum-ber-et or bum-ber-ay, though I prefer the latter. Either way, what a quick weave, and the towels have a nice texture to them. These are the first towels that I've woven using Maurice Brassard 8/2 cotton, and I really enjoyed using it. The colors aren't as vibrant as 10/2 mercerized yarn, but it has a much better feel to it than the 8/2 unmercerized cotton from Halcyon. That yarn has quite a rough texture. and 2 from black cottolin. Although that yarn was 8/2, it seemed a bit thicker, and so the towels have a different feel to them. When you look at a closeup of the cloth, you can see a small pattern that seems to remind me of cloven hooves, for some reason. All in all, these were a fun, quick project that used stash yarn only, so a win-win. They will soon be listed in my Etsy shop, after I come up with some text that sounds knowledgeable. I got word last week that a long time coworker was going to resign after 40 years as a nurse! She and I have had our moments, but I've learned so much from her over the years that I wanted to make something for her that she would like, so I temporarily shelved my next project and whipped up a tencel scarf for her, using a draft that is so intricate and popular. I originally found it on a blog, http://weeverwoman.blogspot.com/, where on Nov 23 2009 Susan graciously shared the draft. I've woven this several times, and I know my coworker once spoke of wanting one, so I quickly measured the warp and dressed the small loom. After I lashed on, I wove a few inches, when I found a sleying error. I just couldn't bring myself to unweave, or snip out all those weft ends, so I cut the warp, resleyed and lashed, and started again! 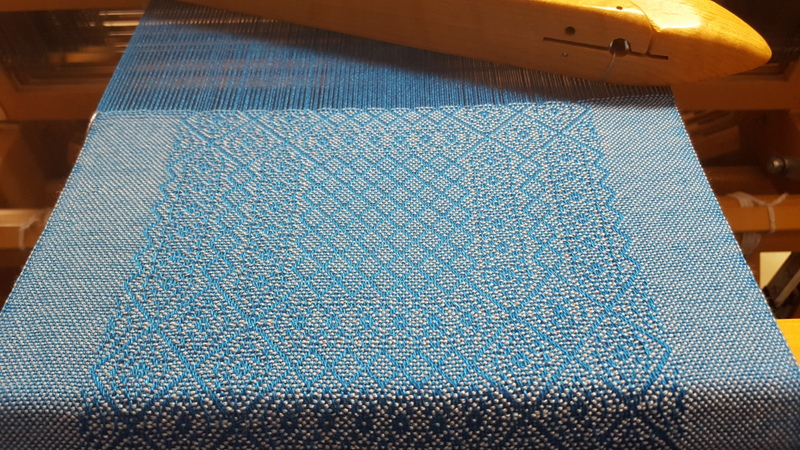 Good thing I found the error so quickly - with the new shortened warp, I was just able to weave the correct length. I hemmed it this morning, wet-finished it, and it is now laying flat to dry. Just love this draft! As bad as I am about keeping up with this blog, it's going to get worse, I fear, as the next Competition of Weavers is happening over on Facebook. I wasn't sure that I would be taking part this time, but the theme is "Under the Microscope," and I very quickly had what I feel is a unique inspiration, so I'm all in. If you remember from last time, everything surrounding this competition is top secret, so I won't be sharing any details until the voting is over on April 7th. There have been rule changes, though, one of which is that the wrap has to be a one of a kind, so no long warps. Barring unforeseen issues, my entry should work up fairly quickly, after which I can start my next, public project. Weather-wise, we have emerged from 2 weeks of the deep freeze, and have experienced 2 days of relatively mild weather, with temps in the upper 30's-low 40's. We were very fortunate to have missed the blizzard that affected so many on the East coast, and we watched and remembered that last year on this very day we ourselves got 2 feet of snow. It was the beginning of what was to become one of the worst winters on record for cold and snow. I hope everyone stayed safe, and that things are returning to normal, with power and passable roads. This El Nino is really crazy this year! Ends of woven tea towel warps make great dish clothes. I cut them the desired width and length, serge around the ends and voila a dish cloth like no other! Where did you find the bumberet draft for your towels?